This talented trickster will use its antics to lower your defense and prolong the battle. Make sure you have HP recovery measures handy! 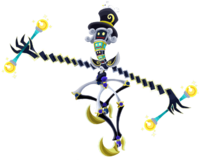 The Trickmaster Ω is a raid boss Heartless that appears in Kingdom Hearts χ.